After profiling, the next step is to repair the garage floor where needed. 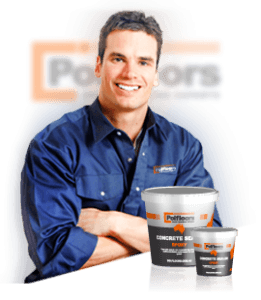 A latex crack repair product should not be used because latex is soft compared to concrete and epoxy. Another reason is that latex shrinks with time and can create a depression underneath the flooring that can make the repair obvious. The epoxy coating is not flexible and it may crack under pressure. If you have decided for the seamless floor look, then now is the time to fill in your contraction joints. Keep in mind that when repairing the cracks or going for the seamless look, it is crucial to ensure that the damaged surface is flat and smooth. If this is not taken care of, the repaired areas and seams can imprint on the coating from underneath and become visible on the outside. A good method to prevent this, is to grind the surface after the repair is done and dried, so that it can be smooth and level and eventually not show on the coating. In case of extensive repairs, a good way of hiding them is to use a lot of color flakes. The colored layers will hide any blemishes in the concrete. The tools and supplies needed are listed below. Some of these tools may be available in a garage floor epoxy kit purchased from an online vendor. We include Optional tools like 18” rollers .These are not compulsory, but these may speed up the application process because of the wider rollers. These are highly recommended for areas larger than 45m². Tools like the 45cm roller, paint tray and spiked shoes will most likely not be include in the kit and have to be purchased online. Most centers of home improvement don’t have them. These products enhance the speed and make the application of epoxy garage flooring easy. The purpose of spiked shows is to walk out onto the coating while installing and tossing the color flakes. A separate pair for each installer is recommended. Be generous with the rollers and don’t reuse them for additional coats. To ensure a blemish free coating, use premium lint free products. Having one extra is a good idea. Unused materials can always be returned.